The international AUGUR research consortium published a Policy memorandum, in which it outlines possible ways out of prolonged stagnation and low growth in Europe. The European Union has reached a critical juncture in dealing with the fallout from the 2008 financial meltdown that started in the USA and spread to engulf banks and the financial markets of Europe. The ensuing recession or stagnation in many member countries was compounded by austerity programs undertaken by national governments, in some cases as a pre-condition for rescue from potential bankruptcy. Europe’s leaders took initiatives to strengthen financial systems but have been unable to secure a significant recovery of the European economy or avert growing divergences between member states in GDP per capita, unemployment rates and external-account balances. 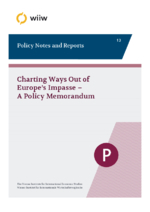 This Policy memorandum written by participants of a 3-year research project on Europe and the world’s socio-economic future to 2030 (AUGUR) discusses possible ways out of prolonged stagnation and low growth. The current trajectory can trigger renewed crises of political-economic sclerosis in Europe and progressively undermine social standards and well-being. Such an outcome would strengthen the forces that aim to dismantle European integration. An overriding priority must be given to rebalancing the distribution of growth between different parts of Europe. Policies in R&D, competition and external trade must be reassessed with these objectives in view. EU finance for social programs in lower-income countries is needed to support improvements in education, health and other public services that benefit social cohesion thereby securing the foundation for higher productivity and competitiveness.